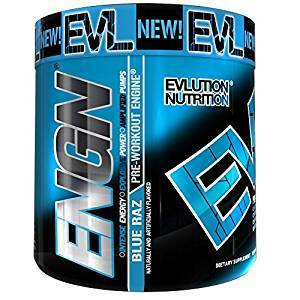 ENGN is EVL Nutrition’s main pre-workout product. Evlution Nutrition—EVL, for short—has launched as an exlusive on Bodybuilding.com. And it is constantly ranking on the site’s top 10 products. Mike Spinner is EVL’s founder and a retired BMX pro. Let’s take a look into what ENGN Brings. The label is pretty straight forward. Most of the list here, is your usual ingredients you’ll find in most pre-workouts. Unfortunately some of them are bunched together in a proprietary blend. Another point worth mentioning is that from the dosages of some of the key elements in ENGN it is quite clear that this is a two sooper. 750 mg Magnesium Creatine Chelate (Creatine MagnaPower) 1600 mg Beta Alanine is on the low side of the clinical dose. Beta Alanine is a proven ingredient known to increase endurance. The combination of the Creatine Monohydrate and the Magnesium Creatine Chelate gives you a total of 2 grams of creatine. 2 grams is a bit low, as in this dosage it doesn’t necessarily increase creatine levels in your body, but rather helps maintain creatine stores. Betaine Anhydrous, L-Tyrosine, Agmatine Sulfate (AgmaPureTM), Caffeine Anhydrous Infinergy TM, (DiCaffeine Malate), Alpha Glycerophosphatidylcholine, Choline Bitartrate, PikatropinTM (picamilon), Huperzine A) Long list of ingredients, Though we hate ‘secret’ blends, the list on ENGN certainly looks promising. The Label’s Bottom Line- Though there’s nothing earth shattering in ENGN, it provides a very well-rounded label (for 2 scoops), definitely f.
Taste & Mixability – As always with EVL, the taste is incredible. All flavors taste great and mix well. Can’t do much better than this. Effectiveness – Because of the doses being on the low-end of the clinical doses and the low stimulant formula, we didn’t expect to get much of a pump (and we didn’t). We did think it was very effective in driving focus and increased power. One thing we did like a lot, was the longevity of the formula which seemed to last for at least 2 hrs. At a $29.99 retail price, you could argue that it is overpriced compared to the alternatives out there. But Bodybuilding is frequently running some sort or special on EVL and we hunt down ENGN on a BOGO free, at $15 per tub it’s worth giving it a shot. If you’re looking for a solid pre-workout that doesn’t depend on extreme stimulation, the ENGN might the one for you. Don’t expect anything spectacular, but a good value for money run of the mill PRE WORKOUT.